One of the most fun things during Christmas is the sight and smells that always seem to permeate through the air. This is probably due to the many wonderfully delicious Christmas treats that are always available during this time. The season wouldn’t be complete without them and they should always be available in our homes for a more festive and welcoming atmosphere. If you aren’t one to enjoy cooking and baking yet still would want some of the most delicious treats, you don’t have to worry. 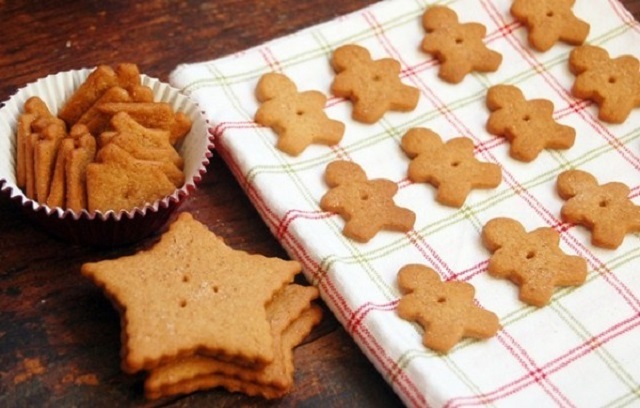 There are many delicious but easy to prepare Christmas goodies. It doesn’t take a long time to make them and they always taste good. 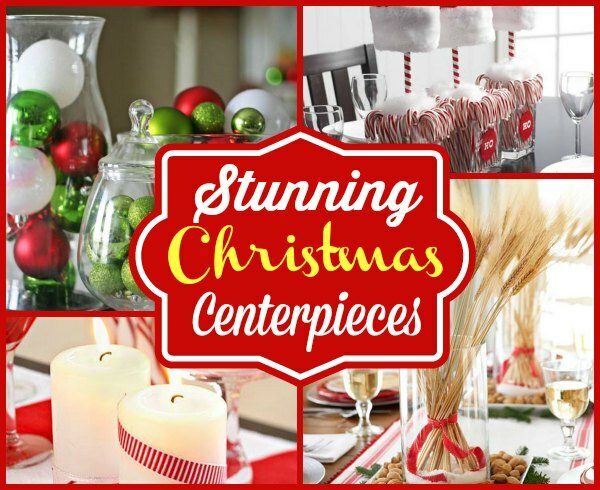 With this compilation of some of the best easy Christmas treats, you can be sure that your home will be festive and merry this holiday season. Kids love Christmas for a lot of reasons. Give them even more reasons to love Christmas with these delectable treats that is especially made for them. They are all wonderfully delicious and it doesn’t even take a long time to prepare them. 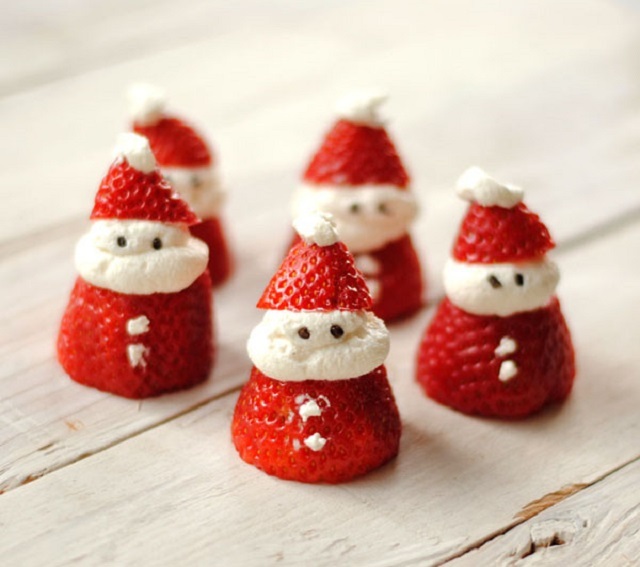 Santa never looked cuter and tastier than this Santa strawberry treat. All you need to do is cut the strawberry into half and add whipped cream to create the face details. You can also add in some chocolate sprinkles for Santa’s eyes. You probably wouldn’t be able to go on a sleigh ride in this deliciously tempting candy cane sled. You and your kids will find these treats too delicious to resist and you’d probably end up consuming them fully before they even go out for a ride. 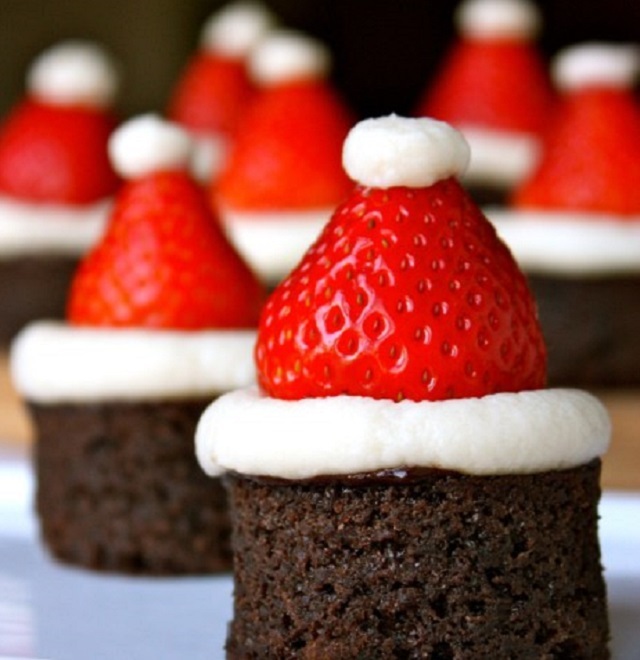 Everyone and everything would want to wear a Santa hat during the holidays, even brownies! 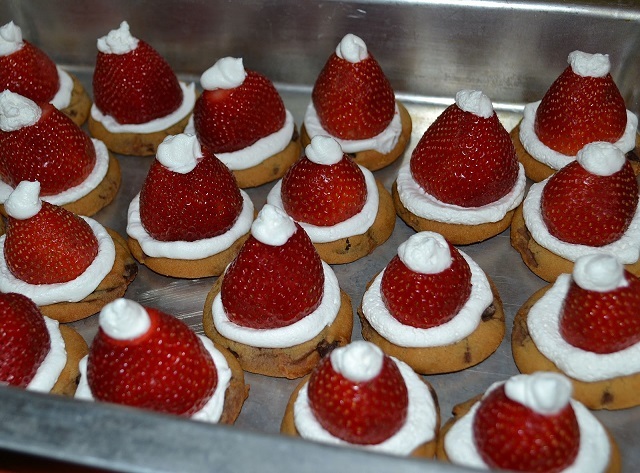 To make your traditional brownies more festive and in line with the season, top it off with a Santa hat fashioned from a cut strawberry and cream. They not only look great but they taste just as divine as well with the mix of flavors. Kids love marshmallows and practically everything sweet. You can go all out with a highly creative cocoa cup inspired treat using marshmallows as your cup and topping it off with chocolate syrup. 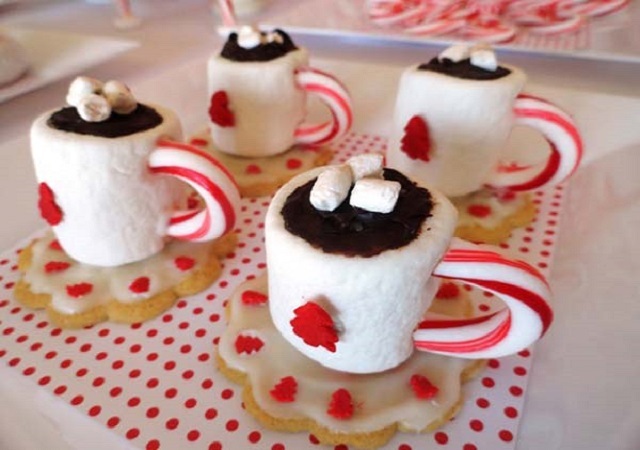 You use other candies like Christmas sprinkles and candy cane to adorn the cocoa cup treat. Donuts are delicious all year round. 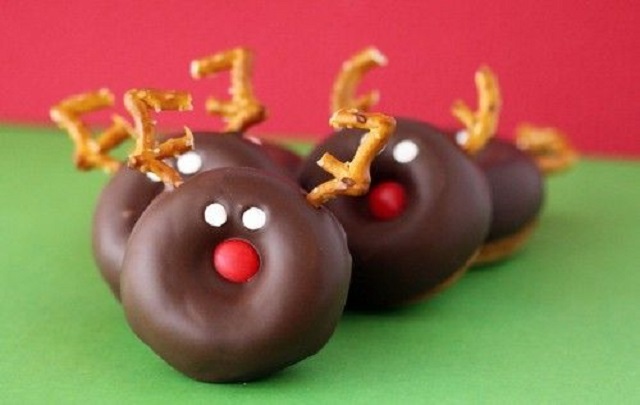 They can be more in line with the Christmas theme by turning chocolate covered donuts into reindeer faces. You can use pretzels as the horns and other sweets for the face. Rice krispies make great Christmas treats because of their deliciously addictive taste. 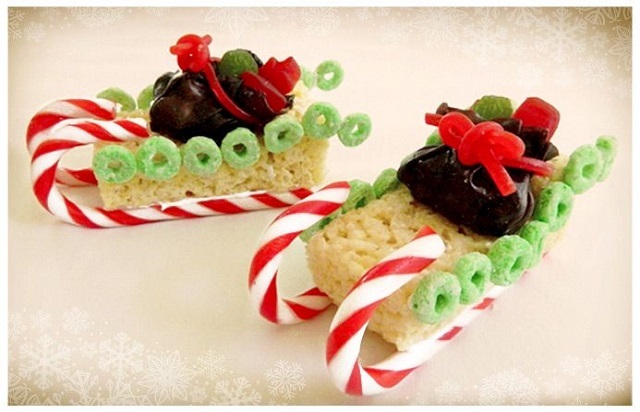 You can even add some fun to your regular rice krispies treats by fashioning a sleigh ride using the rice krispies, candy cane and other candies to make a rice krispries sled. 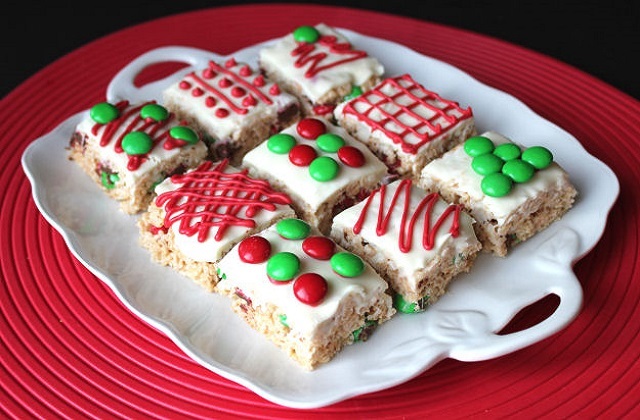 You can stick to being more traditional with rice krispies and just adorn them with some Christmas designs. Since they offer a great canvas to do so, this simple yet delicious treat is sure to be a favorite during the Christmas season. 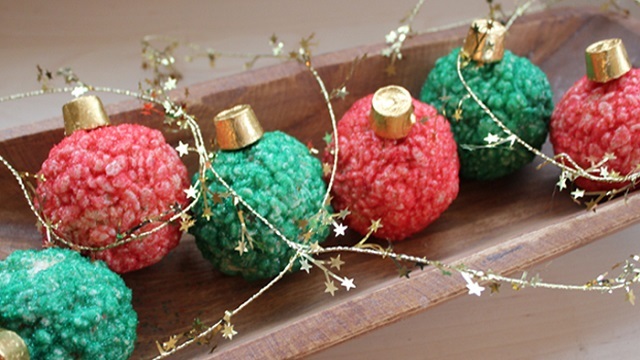 Your Christmas ornaments could be made of very delicious rice krispies in various colors. You can actually use them as real decorations but don’t expect that they will last until Christmas morning because someone is bound to take a bite off those delectable treats. If you aren’t a wiz in the kitchen, you can still create some of the most delectable Christmas treats like this colourful butterscotch. 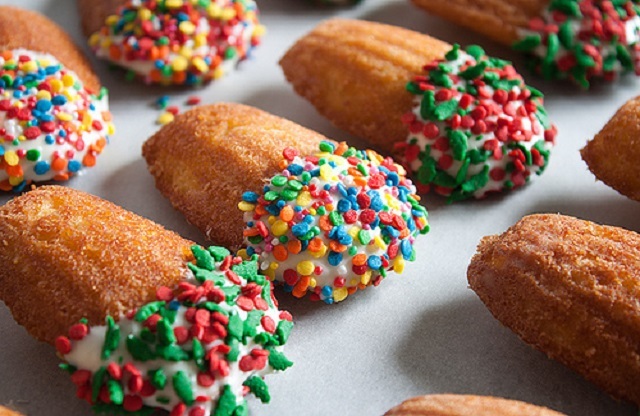 You only add sprinkles to make them look happy and festive. You can stick to Christmas colors of red, green and white to give it a feel of Christmas. Have you ever considered actually making a Christmas treat by not having to cook or bake at all? All you need is a carving knife and you can already have the most delectable treats! Watermelon is a great fruit to work with because of its color palette. 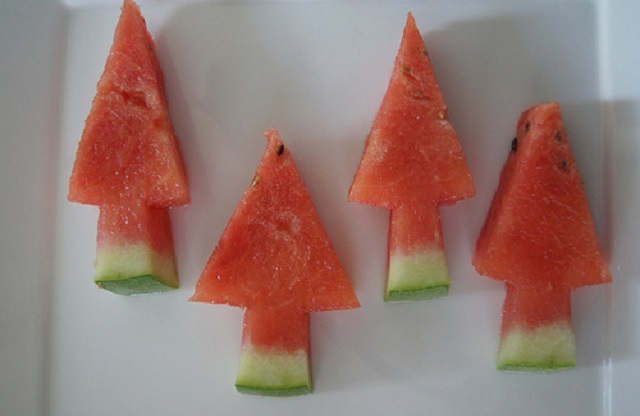 You can easily carve out Christmas trees that will make great snacks or desserts. Cookies are relatively easy to do so you can choose to make them more exciting and more festive looking by adding (again!) a Santa hat crafted from strawberries and cream. 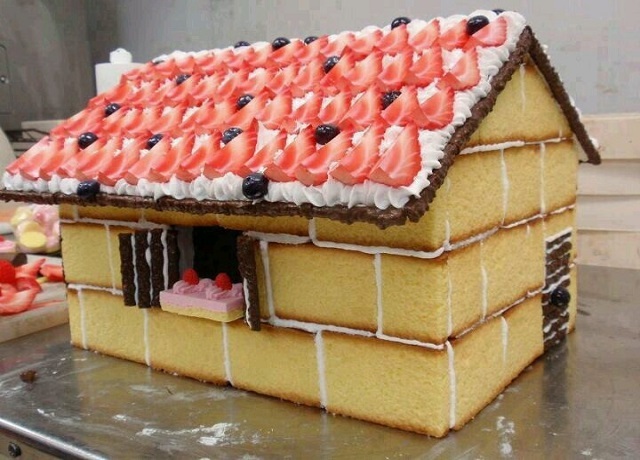 If you want to challenge yourself to create something out of the ordinary, try making a cute edible Christmas house using cakes, chocolates and other sweets. It may be a painstaking process but the result is just too cute. Imagining what Santa would look like going down the chimney would be exactly like this cupcake. 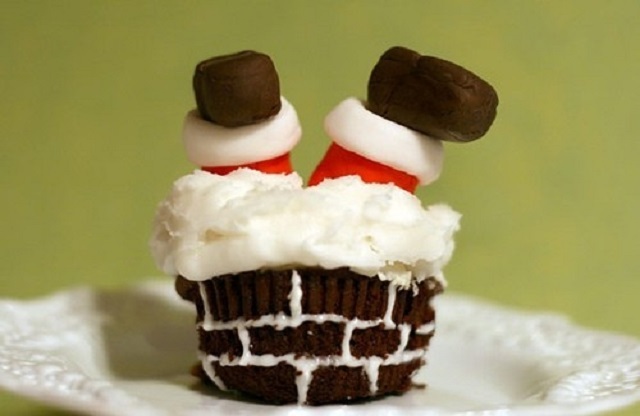 Inject humor into your Christmas treats like this cupcake. It will not only taste good, it will surely bring a smile to everyone’s face. 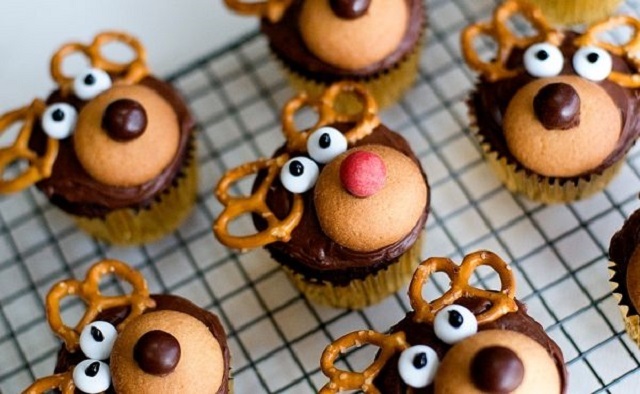 You can top your cupcakes with cute reindeer faces using other goodies like pretzels, chocolates and cookies. 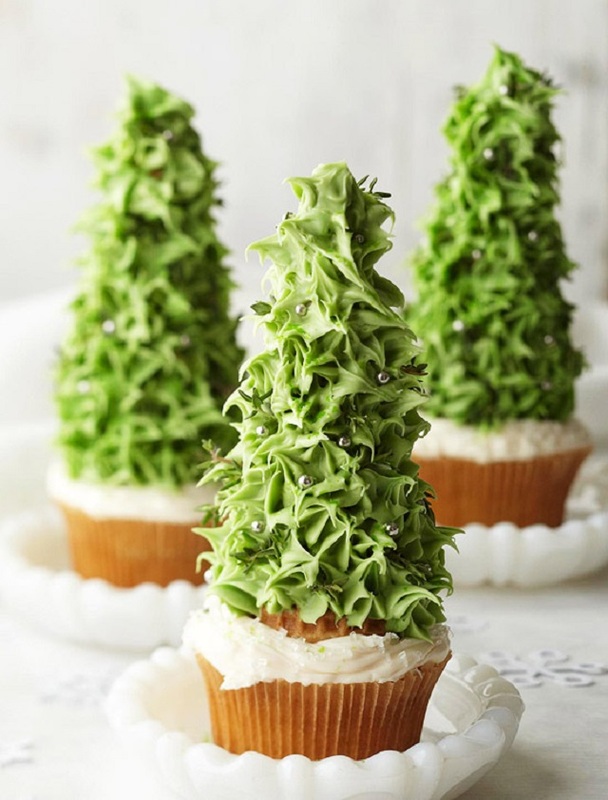 You can go all out with your cupcake toppings by adding a Christmas tree using frosting and silver sugar balls. Push your creativity to the test with this cute Christmas treat. 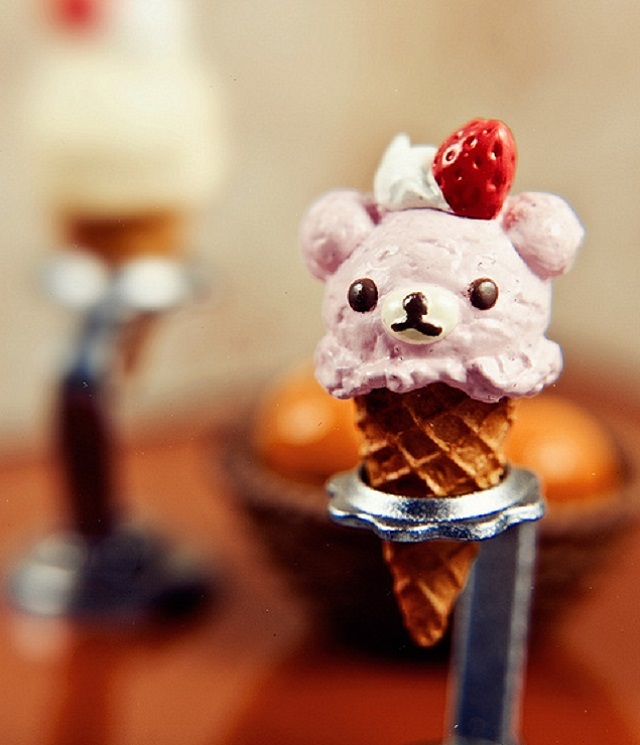 Sometimes you don’t have to go all out to make cute treats. 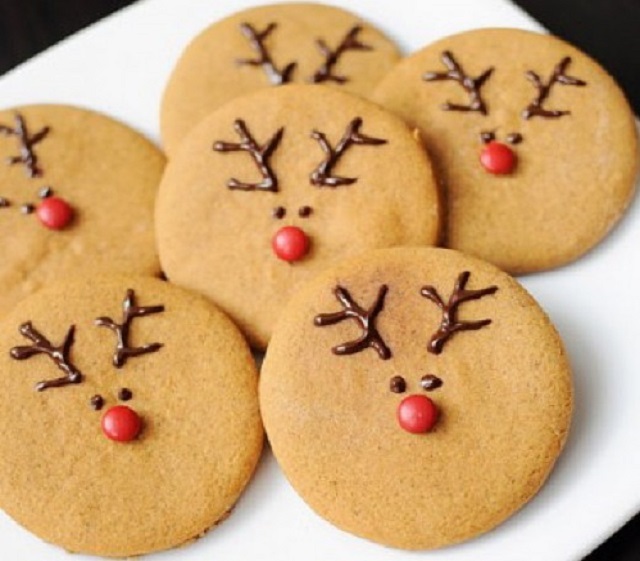 At times painting a reindeer face on a plain cookie could be festive enough for the occasion. Christmas is the time when everybody would want to go home for several reasons. One of those reasons is to experience the distinct taste and smell of the season. Homemade Christmas treats always leave people feeling a little melancholic. This year, make something extra special for those who are coming home this Christmas. You don’t need to embellish on your treats to keep them in the theme of Christmas. You can simply shape them into forms that we often associate with Christmas like the gingerbread man, stars, Christmas trees and more. 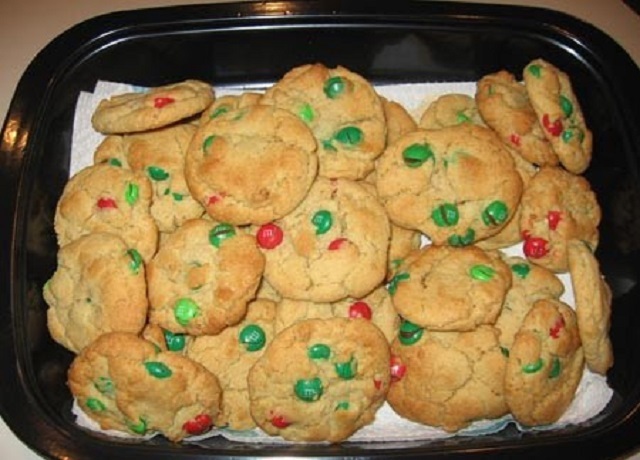 Cookies with M&Ms are very popular because they are among the tastiest goodies. 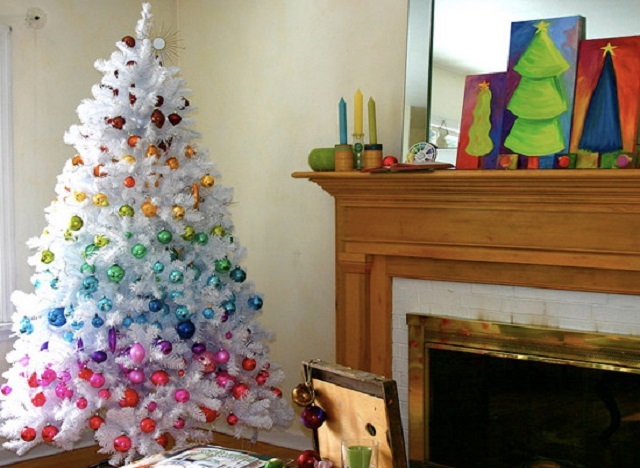 You can make them by just using the colors green and red, which are the two prominent colors of Christmas. They don’t have to be over the top to scream Christmas; they can be as understated as these tasty cookies and still be able to give the vibe of the season. Dark chocolate chip cookies already sound too tempting to pass but they can seem a little too serious. So add something that will turn these dark delights into festive holiday treats. By adding frosting and some other embellishments, you can turn any chocolate chip cookie into a Christmas treat delight. Not everyone is born a baker. If you happen to be pretty bad in this category, you don’t have to worry. There are a lot of goodies that you can still make without having to bake. They taste just as good too. Your Christmas treats can come from very unlikely sources – fruits and vegetables. But no matter how unconventional they may be, they can actually make tasty and highly decorative Christmas treats. Don’t serve them as is though. Use your creativity to come up with the most unusual combinations of the fruits and vegetables to make your treats. 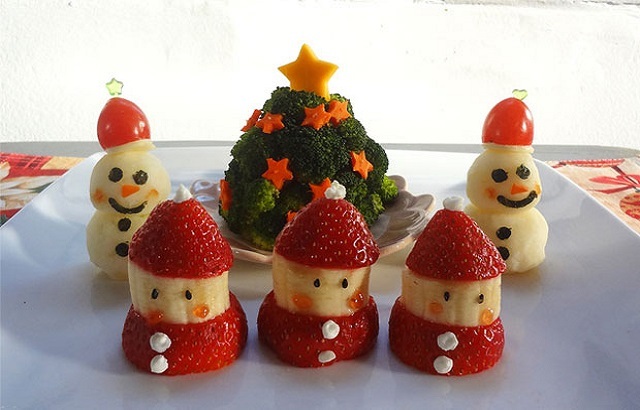 You can make little Santas and snowmen out of bananasand strawberries. You can even make a tree out of broccoli. Be creative and think of fun ways to present them as luscious treats. Ice cream may not be a likely option for Christmas treats but you have to admit that they are very tasty. So why not serve them as treats this season? You don’t even have to be very literal in your Christmas interpretation of this treat and just go with something cute and adorable like a cutie Christmas bear. 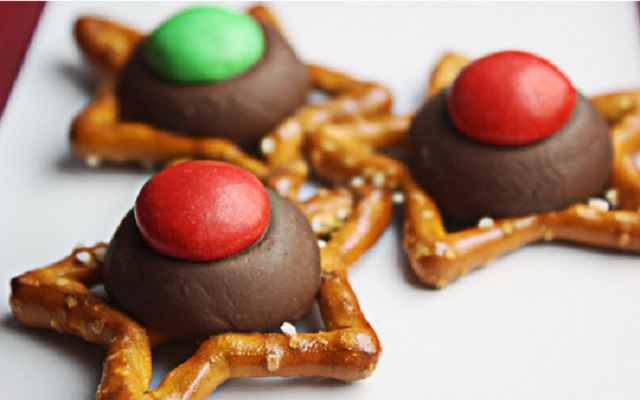 You can use star shaped pretzels and top them with some chocolates so they will look like Christmas star cookies. You don’t need to bake in order to create delicious cookies. 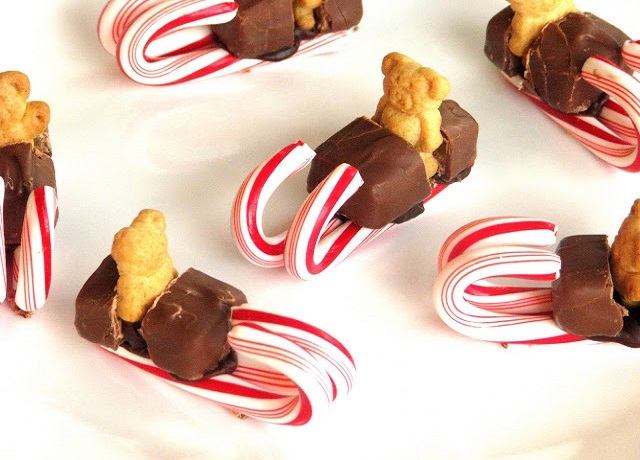 All you need is a little bit of ingenuity and you can have your no bake Christmas treats. 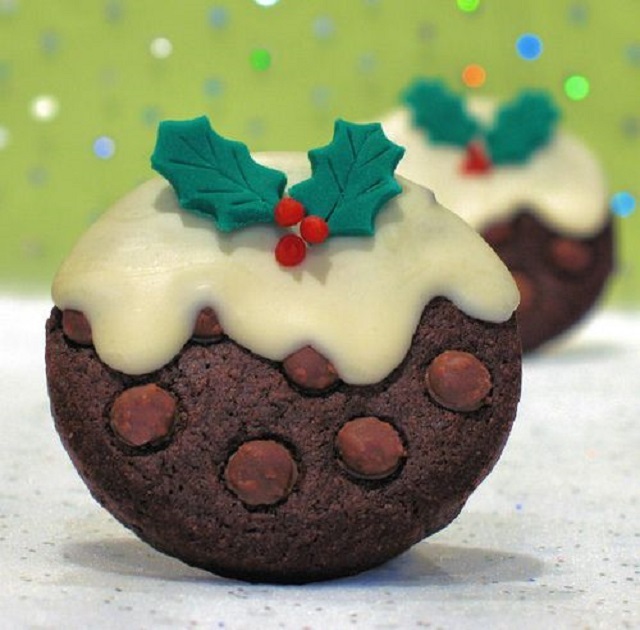 Do you have any easy Christmas treats that is perfect for people who do not wish to spend so much time in the kitchen? Share it here and spread the spirit of Christmas!